Meteor is part of the so-called "hybrid culture" processes described in the section attached growth processes. 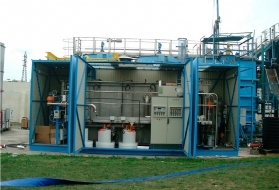 It is a biological reactor for carbon and nitrogen removal, in which bacteria are attached to mobile media. These media, made of plastic with a density slightly lower than that of water, are specially designed to produce a sustainable and stable colonisation. The Meteor reactor is contuously aerated by compressed air whose role is to supply oxygen required by the bacteria on the one hand, and to ensure that the support carrier remains in suspension on the other. In order to guarantee correct operation, careful pretreatment is recommended for all applications: fine grit screening followed by primary settling and then fine screening. fine screening to avoid fouling of screens by plant fibres. a tank shape and suitable aeration design in order to avoid accumulation of the supporting media in the retention screens. In this configuration, activated sludge (free culture) and a fixed culture on a mobile media have been combined. In this case, all of the active biomass is fixed on mobile media. No recirculation takes place and separation is either carried out by high speed floatation (Greendaf) or by filtration (Compakblue) when Meteor MBBR is used for tertiary treatment. 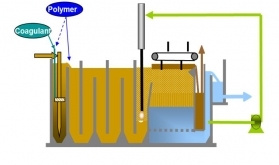 Fixed biomass develops on media specific to these applications. These media are made from extruded, cylindric polyethylene. Their characteristics (between 450 and 660 m2/m3) provides a contact surface area with an optimal environment for biomass growth thereby enabling high loads to be applied. Material's must be chosen according to the compactness required and constraints in terms of volumes imposed in the case of refurbishment works. The Meteor IFAS should preferentially be adapted to treat residual urban wastewater with the removal of nutrients (nitrogen and phosphorous). It must be particularly competitive during refurbishment operations with stringent discharge standards and/or with highly restricted surface areas. 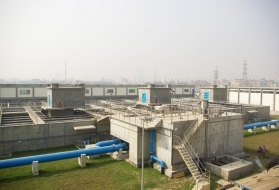 The Meteor MBBR may be used for the treatment of residual industrial and urban wastewater and as a secondary treatment to remove carbon and carbon and nutrients as well as a tertiary treatment to remove nitrogen (denitrification, nitrification or nitrification denitrification). Modularity: According to expected guarantees in carbon and nitrogen discharges, the number of anoxia and aerobic zones implemented must be adapted. 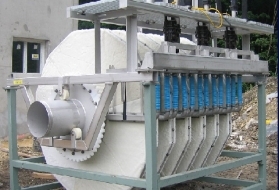 Easy operation: The automated system operates continuously and does not require that the materials be washed: operations are therefore optimized. Environnement: In addition to meeting the most stringent discharge standards, Meteor was designed with air diffusers instead of pierced pipes for aeration purposes in order to improve energy efficiency. This oxygenation design optimizes performance by reducing both the quantity to be injected and the size of blowers. Lastly, the unit's compactness significantly reduces the plant's footprint compared to a conventional sludge treatment plant. difficulty in obtaining boosted removal of total nitrogen with certain types of raw water, low BOD5/NK ratio and high NK concentration or a requirement to inject an exogenous source of carbon. Combining a mixed culture with a Membrane BioReactor had been developed to achieve high carbon pollution removal yields of over 98%. In industry, the two Méteor and Ultrafor technologies, used separately, have largely proven their worth. For example, in the case of Méteor this has been shown through the biological treatment of pulp & paper or agri-food effluent and in the case of Ultrafor for pharmaceutical, cosmetic, petrochemical and cannery effluent. Mixed culture provides stability to biological processes as well as excellent resistance to fluctuations and surges in loads, whilst excellent separation of the biomass and treated water can be obtained with the MBR. 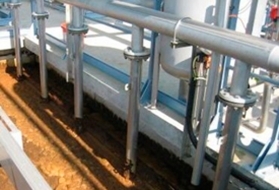 The technological choice of using a physical barrier provided by a membrane also guarantees perfect environmental compliance because sludge does not migrate to the receiving body. Processes using membranes are modular and in the event of increased production, it easy to adapt to this by simply adding modules. Implementing membrane filtration ensures that treated water is of a constant quality, independent of the sludge's settling properties. Among other malfunctions, filtration enables the proliferation of filamentous bacteria to be overcome, an phenomenon which is frequent in highly biodegradable environments. This technology allows old sludge to be maintained permitting stable boosted breakdown of the organic matter and a reduction in excess sludge production. These two technologies, as fixed biomass and free biomass working at a low load, complement each other when combined. Indeed, the quality of treated water is improved due to the development of a specific fixed biomass which requires a high retention time and which acts on pollution which is difficult to biodegrade. 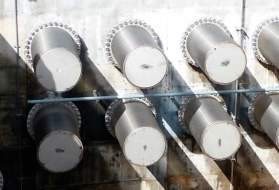 The membrane's filtering flow rate is also improved too thanks to reduced concentration levels and the quality of the free biomass in the reactor. The reduction in soluble residual COD is also a factor which is conducive in increasing the permeate's flow rate. The Méteor concentrates fixed biomass and membrane separation concentrates the free biomass, allowing high volumetric loads to be obtained, whilst maintaining low mass loads, thereby creating a more compact system than conventional processes. This combining technique works when pollution load is low (kgDBOD5/kgTSS/day) with a decrease of between 20 to 30% in the biological reactor's volume. If there is no decrease in the reactor's volume, the membrane's surface may be decreased by 20 to 30%. 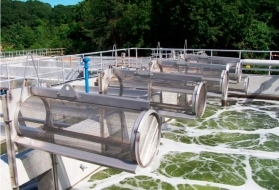 Excellent quality of treated water when discharge standards are stringent. In certain cases it avoids having to implement tertiary treatment. Suitable technology for agri-food, pharmaceutical, chemical, petrochemical, pulp & paper effluent ... and for residual urban water.